strauss.training – Building Brands From the Inside Out! "...a master of team development..."
"...a positive and energetic force..."
"...a high standard of excellence..."
Empower your office and field personnel with tools to build outstanding customer relationships. Increase revenue and reduce turnover by crafting an environment of positive, branded communication. Whether you’re opening a new restaurant or have been around for 30 years, our expertise in management, training, and consulting can help ensure ongoing success in an otherwise volatile industry. The brand puzzle has lots of pieces! With communication as the key piece, our extensive experience with ERP and CRM implementation, TV commercials, web, and other related competencies can help with any project. What happened when we trained 500+ office and field staff at the largest residential HVAC and Plumbing company in the U.S.? Most HVAC and Plumbing companies have 3-10 employees. Four Seasons has well over 500 and continues to grow. With 350+ vehicles on the road, they are able to quickly serve customers throughout all of the Chicagoland area and Northwest Indiana – 24 hours a day, 7 days a week, 365 days a year. Continuing to build upon this legacy of quality service makes Four Seasons the largest, independently-owned residential HVAC Company in the U.S. and Canada, with over 380,000 customers. We are proud to have helped build an effective, innovative sales and customer service communication structure throughout Four Seasons that continues to maximize the success of over 1.4 million annual phone and in-person customer interactions. Consulting services provided: Sales Training, Customer Service Training, Strategic Partnerships, Branding and Marketing, TV Commercial Production, ERP & CRM Implementation, and more. The Better Business Bureau’s annual Torch Award for Marketplace Ethics is by far their most prestigious award. 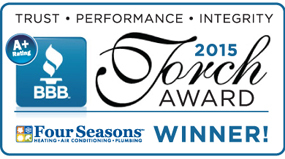 In 2015, Four Seasons – already an A+ Rated business for many years – became the only HVAC and Plumbing contractor in Northern Illinois to ever receive this honor. The BBB’s thorough selection process examines every aspect of each nominee’s business practices, including initial and ongoing training, truth in marketing, customer service, and sales practices. Our top priority is crafting effective communication to establish and maintain lasting, positive customer relationships. Needless to say, we are very honored to have our efforts recognized by the BBB — and pleased to have played a vital role in the success of one of the most respected brands in the HVAC industry. What do others have to say about working with us? Brand-aware communication training for a consistent, global message. Scalable, organic solutions, designed down to the word and phrase. Staff motivation for optimal, long-term results. Solutions molded specifically to your industry, business model, and company culture. Measurable ROI for revenue, cost-savings, and employee retention.